A page for the books of David Weinstein, including The Eddie Cantor Story and The Forgotten Network. Order David's new book, The Eddie Cantor Story: A Jewish Life in Performance and Politics from University Press of New England/Brandeis University Press. This absorbing biography chronicles the life and work of one of the most important entertainers of the twentieth century. Eddie Cantor (1892–1964) starred in theater, film, radio, and television. Paying equal attention to Cantor’s humor and politics, Weinstein documents his significance as a performer, philanthropist, and activist. Illustrated with thirty photographs, The Eddie Cantor Story examines the evolution, impact, and legacy of Cantor’s performance style. University Press of New England/Brandeis University Press site with additional information here. The gallery shares audio, video, and photos, including many rare items. Educators and others holding book discussions will find these resources to be especially useful. During the late 1940s and early 1950s, the name DuMont was synonymous with the new medium of television. Many people first watched TV on DuMont-brand sets, the best receivers money could buy. More viewers enjoyed their first programs on the DuMont network, which was established in 1946. Network founder Allen B. Du Mont became a folk hero for his entrepreneurial spirit in bringing television to the American people. Yet, by 1955, the DuMont network was out of business and its founder and namesake was forced to relinquish control of the company he had spent a quarter century building. The heart of The Forgotten Network examines DuMont's programs and personalities, including Dennis James, Captain Video, Morey Amsterdam, Jackie Gleason and The Honeymooners, Ernie Kovacs, and Rocky King, Detective. 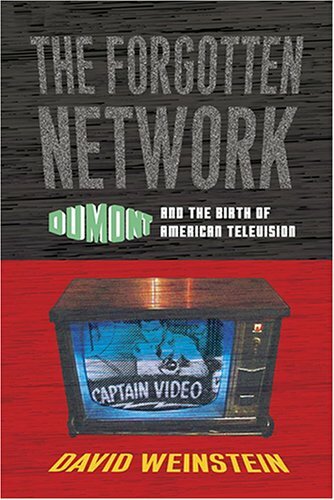 "In The Forgotten Network, David Weinstein performs a singular task of historical recovery, using archival materials and recollections of surviving DuMont employees to bring to life the story of this maverick network... Weinstein's book is elegantly written, richly detailed, and offers the reader a glimpse into an era that has all but vanished." "In The Forgotten Network, David Weinstein moves with sure mastery and ready wit through the technological issues, political machinations, and blurry kinescopes that tell the story of the ill-starred DuMont network. Sharply insightful and smartly written, Weinstein's TV guidebook to a lost chapter in American broadcasting is a major contribution to both television studies and Cold War history. He answers a question that has bedeviled media scholars for decades: how did four networks become three?" You can find excerpts from the book, an interview with David, and more excerpts from reviews on the Temple University Press website. The gallery includes a link to David's instructor's video, filled with clips from DuMont programs.